He was so popular in fact, that he was given the nickname "The Sound of the Nile". "Yes, it's quite often in the Arabic world that these nicknames are given to a singer," says Tamino on the phone from his home in Antwerp. "Sadly, he died when I was five so I don't really remember him. I have his records and I listen to them quite often at home. I especially love his live recordings because then you really hear his extraordinary voice - it has such a musicality and intensity and I'm really proud." "Fouad had a unique character," said movie critic Tarek Shinawy, following the singer's death in 2002. "As an actor, Fouad enjoyed his limited talents, but his songs are still sung and loved by people." Tamino - who is signed to the UK indie label Communion - released his debut album Amir during the summer. Its lead track, the haunting Habibi (Arabic for "my love") drew comparisons with Jeff Buckley and Thom Yorke. Particular praise was given to Tamino's voice, which soars from a throaty croon to a glass-shattering falsetto in a single breath. "Of course it's flattering, they're amazing musicians and singers and those comparisons bring a lot of expectations and I feel like I'm just starting out and I've got so much to prove and in the end, everybody is doing their own thing and you just want to be recognised for that." Tamino - whose first name comes from the hero of Mozart's The Magic Flute - discovered his voice when he began singing at home after school before taking himself off to Amsterdam to study music at the age of 17. "It was very natural to always sing within my full range. I think it was because I could express some emotions better when I sing a higher set of notes and some others that are expressed within the lower frequency. "The falsettos sound more like crying and the bass can be more like a confident sound, it was a way of expression." 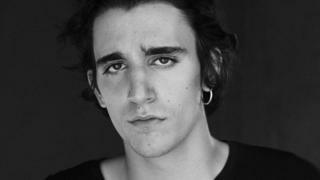 Singing in English rather than French, Dutch or even Arabic - Tamino's music marries his western upbringing with his middle eastern roots, creating a sound that is unique. "It was a conscious decision to record with an Arabic orchestra on some songs in order to emphasise it. The sound is so beautiful, they bring such greatness to it, this almost royal sound." "Some people think it's risky to mix Arabic music with soul, dub and hip hop. We don't believe that," they told BBC Music News LIVE while artists like Omar Souleyman and Egyptian rapper Ahmed Mekky are influenced by western musicians. Tamino points out that unlike Western musicians, an orchestra from the middle east follows the singer's lead rather than the melody in front of them. "We wrote every arrangement down and they stick to the notes but they improvise in between and really add their own expression. They will be a bit more freestyle maybe. "It's different every time the song is played and that's something I really admire and something I wanted for myself." The result gives added intensity to Tamino's sound, which he says is typical of music from the Arabic culture. "There's also a lot of sadness in Arabic music and a lot of melancholy but it progresses to something majestic which I really like. In my own music, the intensity comes from my own search for meaning and beauty but I think it's through intensity that I really can find what it is that I'm looking for within art and within music and within expressing myself." Tamino says he tries to bring that same intensity to his live performances, which he describes as "quite transcendental". "You have to surrender to it in order to really get to the essence. People invest in the music and there's a certain energy exchange between the musicians and the audience, it's a beautiful experience." "He played on one song, Indigo night, he played a beautiful bass line. "Of course it was surreal, but we started talking and it was very pleasant - he told me that he liked the song and I asked him if he would want to play on the recording for the album and he said 'yes'. He came to the studio and it was a great experience." "We are planning on doing some shows in Lebanon and Morocco but Egypt for me is a big step because of my grandfather and because I really want to be ready for it. "We have to really prepare for that."